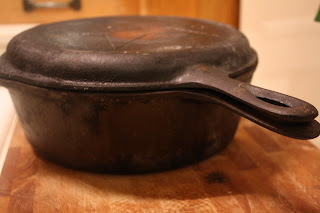 The cast iron skillet....It is like the old faithful blood hound from Lady and the Tramp. Old Reliable, they called him! 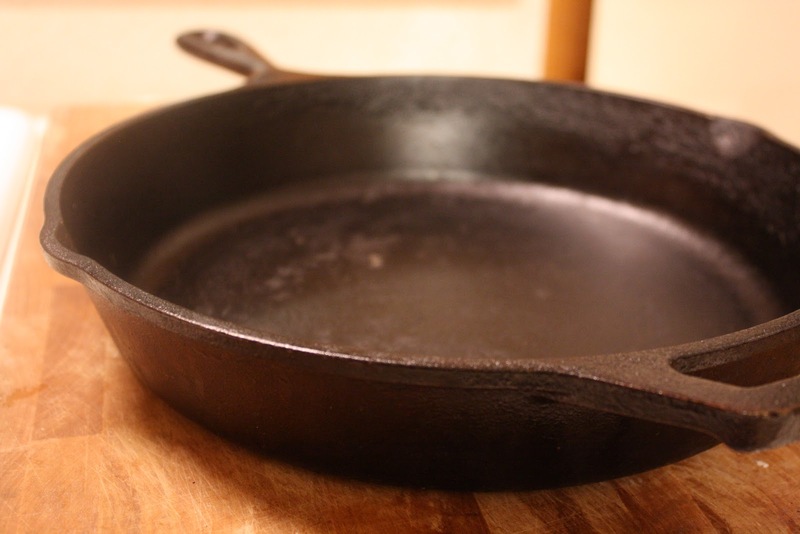 This is exactly what comes to mind every time I look at my cast iron skillet. 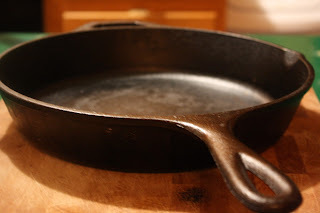 So many times, as I walk through thrift stores, garage sales or, most often, through the flea market I see old skillets for sale and as I slide my fingers across the smooth surface it is as if I am taken back in time. The smoothness developed, nurtured and seasoned by years of cooking, frying, baking and providing sustenance to those who used it. I covet the skillets I find whose flat bottom pan is as smooth as silk and just know that cornbread cooked in that particular pan is what Southern dreams are made of! I feel a pang of sadness when I see a neon sticker with a price of $5 or less stuck to the side of these iron delicacies. It is as if they have been put out to pasture after years of service, hundred of meals and generations of cooks. 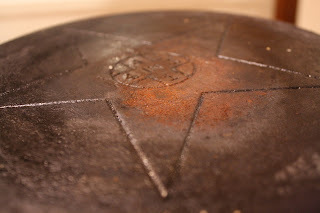 I had the great fortune of receiving my first cast iron skillet from my dear friend, and former roomie, Will Beasley. I hold firm to the fact that Will is one of the greatest gift-givers there ever was, this in large part to the fact that he is one of those few people who actually listens to everything people say. He will remember something that was discussed months prior and surprise someone with the most perfect gift they had forgotten they had even mentioned! This was the case when he gave me my very first cast iron skillet. As I opened the heavy box in anticipation I was so pleasantly surprised with its contents that I nearly cried! So many thoughts were pulsing through my mind....how thoughtful, how meaningful, how do I season this thing??? For days I scowered the internet trying to find the best way to season my brand new skillet...I was like a kid on Christmas trying to adjust her new bike seat to fit just right! As the years have passed I have inherited several other cast iron dishes and pots from various family members but to this day every time I see my first skillet, the one Will gave me, it brings a smile to my face to think about such a dear friend and thoughtful gift! I’m 52 years old and have been cooking for about the past twenty years. I recently came across a steak recipe that called for an iron skillet and the green lights started to flash because I haven’t seen one of those since I was a child. I usually do a pan fry, transfer to a baking pan and finish In the oven technique when cooking red meat because I like a seared crust on the outside, and then finish it in the oven because I want to make sure the inside of the meat is not under cooked. When I did this steak recipe on the stovetop and then put the pan in the oven, I was rewarded with the best steak I’ve ever had in my life. Who knew that a one pound rib eye steak, a little kosher salt, black pepper and canola oil pan seared and baked steak would come out so delicious? It was all because of the cast iron skillet. Because the sear takes only 30 seconds a side, and the bake (500 degree oven) takes only 2 to 4 minutes a side, I was a bit skeptical because the inside of the steak was still a reddish pink, but once the meat thermometer read 140 degrees (med rare) I knew it was safe to eat. The meat cut like butter and because it tastes so good I did not find the need for sauce. Well, that was my Christmas dinner, and I will probably do the same for New Year’s Eve. The best part is that you never (almost never) have to wash the pan. Just add a little oil and kosher salt, warm up the pan and rub it with a clean rag or paper towels to loosen any residue left in the pan. Then just wipe it all out into a trash can. As I look at my kitchen, and all of the cooking utensils that I have collect over the years, I don’t know how I could have forgotten a dear friend from my childhood.